Lowa has been the most trusted name in hiking boots for over 100 years. Their military and duty boots are designed and manufactured with the same standards. 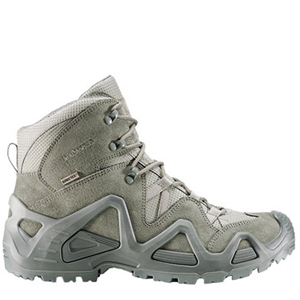 The Lowa Zephyr GTX Sage Green Mid Boot is a lightweight waterproof 6in boot intended for cold weather settings. The short height is suited to easier terrain that doesn't require as much protection as a full height boot. It includes Lowa's patented Monowrap technology which provides excellent stability and stiffness at a significant weight savings. This boot is part of their All Terrain Collection which include lighter, softer flexing footwear for all day comfort. This boot is made in Germany.